There are a lot of things that are hard to evaluate from the outside when gauging how a company is doing under new management in the midst of a turnaround with big new products coming out. For example, how good is Ultra, Blackboard's new user experience? (At least, I think the user experience is what they mean by "Ultra." Most of the time.) We can look at it from the outside and play around with it for a bit, but the best way to judge it is to talk to a lot of folks who have spent time living with it and delivering courses in it. There aren't that many of those at the moment. Blackboard has offered to put us in touch with some of them, and we will let you know what we learn from them after we talk to them. How likely is Blackboard to deliver the promised functionality on their Ultra to-do list to other customers on schedule (or at all)? Since this is a big initiative and the company doesn't have much of a track record, it's hard to tell in advance of them actually releasing software. We'll watch and report on it as it comes out. How committed is Blackboard to self-hosted customers on the current platform? We have their word, and logical reasons why we believe they mean it when they say they want to support those customers, but we have to talk to a bunch of customers to find out what they think of the support that they are getting, and even then, we only know about Blackboard's current execution, which is not the same as their future commitment. So there are a lot of critical aspects about the company that are just hard and time-consuming to evaluate and will have to wait on more data. But not everything is hard to evaluate. Communication, for example, is pretty easy to judge. Last year I mocked Jay Bhatt pretty soundly for his keynote. (Of course, we have hit D2L a lot harder for their communication issues because theirs have been a lot worse.) In some ways, it is so easy to critique communication that we have to be careful not to just take cheap shots. Everybody loves to mock vendors in general and LMS vendors in particular. We're mainly interested in communications problems that genuinely threaten to hurt their relationship with their customers. Blackboard does have serious customer communication problems at the moment, and they do matter. I'm going to hit on a few of them. Since I critiqued last year's keynote, an update in that department is as good a place to start as any. It's sort of emblematic of the problem. This year's keynote was better than last year's but that doesn't mean it was good. Of the two-hour presentation, only the last twenty minutes or so directly addressed the software. The rest was about values and process. I get why the company is doing this. As I said in last year's review, they are nothing if not earnest. So, for example, when Jay Bhatt says that we need to start a "revolution" in education and that Blackboard is inviting "you"---presumably the educators in the room---to join them, it doesn't carry the sinister tone of the slick Sillycon Valley startup CEO talking about "disrupting" education (by which they generally mean replacing dumb, mean, unionized bad people teachers with slick, nice, happy-faced software). Jay comes across as a dad and a former teacher who honestly cares about education and wants very much to do his part to improve it. But his pitch is tone deaf. No matter how earnest you are, you can't take center stage as the CEO of a software company that has a long and infamous reputation for disregarding customers making education worse rather than better and then, giant-face projected on the jumbotron and simulcast on the web, convince people that you are just a dad who wants to make education better. It doesn't work. It's not going to win over skeptical customers, never mind skeptical prospective customers. No matter how much you sincerely mean it. No matter how much it is said with the best of intentions. You also can't spend the first 90+ minutes of the keynote talking about process and then get around to admitting that your revolutionary software is a year late. Phil and I both give Jay and Blackboard tons of credit for being forthright about the delay in the keynote, and for generally showing a kind of honesty and openness that we don't see very often from big ed tech vendors. Really, it's rare, it's important, and it deserves more credit that it will probably be given by a lot of people. But in terms of having the intended effect on the audience, owning up to your delivery problems in the last 10 minutes of a two-hour keynote, most of which was also not spent talking about the stuff that customers most immediately care about, will not have the desired effect. The reason Blackboard went though that first 90 minutes is that they, really, really want to tell you, with all their hearts, that "Gee whiz, gang, we really do care and we really are trying super-hard to create something that will make students' lives better." But if the punchline, after 90+ minutes, is "...and...uh...we know we told you we'd have it done a year ago, but honestly, we mean it, we're still working on it," you will not win converts. The one thing I did like very much, besides the honesty about missing their delivery dates, was the day-in-the-life walk-throughs of the software. They very compactly and effectively conveyed the quality of thought and concern for the student that the first 90 minutes of process talk did not. If you want to convince me that you really care about students, then don't talk to me about how much you really care about the students. Show me what you have learned from them. Because talk is cheap. I won't believe that you really care about students in a way that affects what you do in your business until you show me that you have developed a clear and actionable understanding of what students need and want and care about. That is what the walk-throughs accomplished (although they would have been even more effective with just a smidge less "golly gee" enthusiasm). There's one simple thing Blackboard could do that would vastly improve their keynotes and make a host of rhetorical sins more forgivable. They could bring back Ray Henderson's annual report card. Every year, Ray would start the keynote by laying out last year's publicly declared goals, providing evidence of progress (or not) toward those goals---quantitative evidence, whenever possible---and setting the goals for the new year. This set the right tone for the whole conference. "I made you some promises. Here's how I did on those promises. Here's what I'm going to do better this year. And here are some new promises." As a customer, I will hear whatever else you have to say to me next much more charitably if you do that first. For example, Phil and I have heard a number of customers express dissatisfaction with the length of time it takes to fix bugs. At a time when Blackboard is trying to convince self-hosted customers that they will not be abandoned, this is particularly important not to let get out-of-hand because every customer who has an unaddressed bug will be tempted to read it as evidence that the company is secretly abandoning 9.1 and just lying about it. But if Blackboard leadership got up on stage---as they used to---and said, "Here's the number of new bugs we had in the past year, here's average length of time that P1s go unaddressed, here's the trend line on it, here's our explanation of why that trend line is what it is, and here's our promise that we will give you an update on this next year, even if it looks bad for us," then customers are going to be much more likely to give the company the benefit of the doubt. If you've addressed my concerns as a customer and said your "mea culpas" first, then I'm going to be more inclined to believe that anything else you want to tell me is truthful and meant for my benefit. What Is Ultra and What Does It Mean For Me? Another problem Blackboard has is that it is very hard to understand what they mean by "Ultra." Sometimes they mean an architecture that enables a new user experience. Sometimes they mean the new user experience that may or may not require the architecture. And at no time do they fully clarify what it means for hosting. Most of the Ultra talk is about the user experience. So it makes sense to infer that Ultra is a new user experience which, for those with any significant experience with Blackboard or many of the other LMS providers, would suggest a new skin (or "lipstick on a pig," as Phil recently put it). And yet, Ultra doesn't run on the self-hosted version of Blackboard. Why is that? A cynical person would say (and cynical customers have said) that Blackboard is just trying to push people off of self-hosting. No, says Blackboard, not at all. Actually, the reason we can't do self-hosted Ultra is because Ultra requires the new cloud architecture, which you can't self-host. Except for Ultra on mobile. You can experience Ultra on mobile today, even if you are running self-hosted 9.1. There you go. Clear as mud. 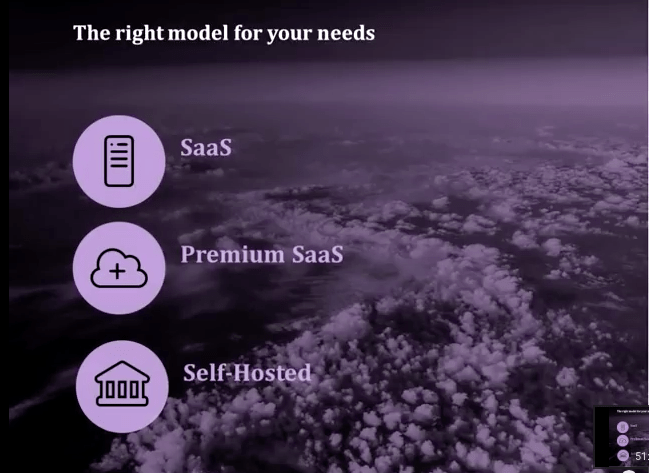 What is "Premium SaaS"? Is it managed hosting? Is it private cloud? What does it mean for current managed hosting customers? What we have found is that there doesn't seem to be complete shared understanding even among the Blackboard management team about what the answers to these questions are. While this still doesn't address the managed hosting customers' questions, it does provide some good additional information. Ultra is Blackboard's new product philosophy and user interface. Rather than just sticking in a new tab or drop-down menu and a new bill from a new sales team every time we add new capabilities, we're trying to design these capabilities into the core product experience in ways that fit with how customers would naturally use them. So rather than thinking about separate products living in separate places---like Collaborate, Community, Analytics, and Content, for example---you can think about synchronous collaboration, non-course groups, student progress tracking, and content sharing naturally when and where you need those capabilities in your daily academic life. Blackboard Learn Cloud [Note: This is my made-up name, not Blackboard's official product name] is the new architecture that makes Ultra possible for Learn. It also enables you to gain all of the benefits of being in the cloud, like being super-reliable and less expensive. But with regard to Ultra, we can't create that nifty integrated experience without adding some new technical infrastructure. Learn Cloud enables us to do that. Update: Ultra is still a work in progress and may not be appropriate for all professors and all courses in its current form. Luckily, Learn Cloud also runs the traditional Learn user experience that is available on Learn Enterprise. So you can run Learn Cloud now without impacting your faculty and have them switch over to the Ultra experience---on the same platform---whenever they are ready for it and it is ready for them. Blackboard Learn Enterprise [another Feldstein-invented name] is the classic architecture for Learn, currently on version 9.1. We think that a significant number of customers, both in the US and abroad, will continue to want to use the current architecture for a long time to come, in part because they want or need to self-host. We are committed to actively developing Learn Enterprise for as long as a significant number of customers want to use it. Our published road maps go out two years, but that doesn't mean we only plan to develop it for another two years. It just means that it's silly to create technology road maps that are longer than two years, given how much technology changes. Because Learn Enterprise shares a lot of code with Learn Cloud, we actually can afford to continue supporting both as long as customers are buying both in numbers. So we really do mean it when we say plan to keep supporting Enterprise for the foreseeable future. We will also bring as much of the Ultra experience to Enterprise as the technology allows. That won't be all or most, but it will be some. The product will continue moving forward and continue to benefit from our best thinking. Self-hosted Learn Cloud isn't going to happen any time soon, which means that self-hosted Ultra isn't going to happen any time soon. It is possible that the technologies that we are using for Blackboard Cloud will mature enough in the future that we will be able to provide you with a self-hosted version that we feel confident that we can support. (This is a good example of why it is silly to create technology road maps that are more than two years long. Who knows what the Wizards of the Cloud will accomplish in two years?) But don't hold your breath. For now and the foreseeable future, if you self-host, you will use Learn Enterprise, and we will keep supporting and actively developing it for you. Mobile is a special case because a lot of the functionality of the mobile app has lived in the cloud from Day 1 (unlike Learn Enterprise). So we can deliver the Ultra experience to your mobile apps even if you are running Learn Enterprise at home. Managed hosting customers cannot run Ultra on Learn for the same reason that self-hosted customers cannot: They are currently using Learn Enterprise. They can continue to use Learn Enterprise on managed hosting for as long as they want, as long as they don't need Ultra. We will, eventually, offer Learn Private Cloud [yet another Feldstein-invented name]. Just as it sounds, this will be a private, Blackboard-hosted instance of Blackboard Cloud. Managed Hosted clients are welcome to switch to Learn Private Cloud when it becomes available, but it is not the same as managed hosting and may or may not meet your needs as well as other options. Please be sure to discuss it with your representative when it becomes available. In the meantime, we'll provide you with detailed information about what would change if you moved from managed hosting of Blackboard Enterprise to Blackboard Cloud, along with detailed information about what the migration process would be like. To be clear, I'm not 100% certain that what I've described above is factually correct, in part because Phil and I have heard slightly different versions of the story from different Blackboard executives. (I'm fairly sure it's at least mostly right.) The main point is that, whatever the truth is, Blackboard needs to lay it out more clearly. Right now, they are missing easy wins because they are not communicating well. Time will tell whether Ultra pays off. I'm actually pretty impressed with what I've seen so far. But no matter how good it turns out to be, Blackboard won't start winning RFPs in real numbers until they start telling their story better.